Well that’s it, everybody. It’s official. 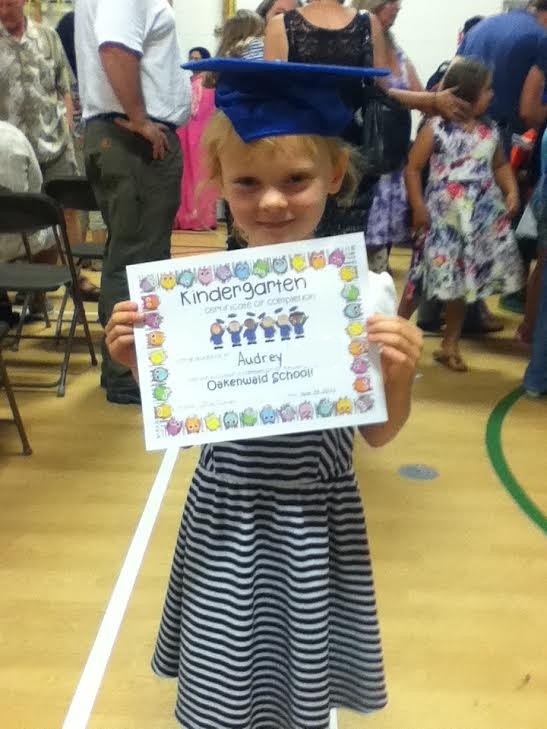 We’re done with Kindergarten. One year down. Twelve to go. But enough about me and my lady friends. Apparently our daughter’s school is TOTALLY OKAY with using the term “graduation” because it’s plastered on the pamphlets and everywhere else. I walked her over to the school this morning, just like I did that very first morning back in September, although this time it was different. We had to go in the morning. It still took just as long though. We had to stop and pick flowers for her teacher, and then we had to race to the cross walk, only to stop again on the other side to pick up pebbles. “MR. BAILEY!” she yelled as she rang up and gave her gym teacher a big hug. “Well, well. Who’s this little movie star? Audrey?” (She was wearing sunglasses). Thanks, Mr. Bailey, for stating the obvious. “Well, see you in gym!” he shouted in a jovial way and went into the school. Mr. Bailey has been teaching there for as long as anyone can remember, and by God he was showing no signs of stopping. I guess there’s something to be said for staying in good physical shape. The “ceremony” itself was to happen at 11 am, so we arrived just a few minutes before to get a decent seat. The place was packed! We got the impression that we couldn’t invite grandparents and the like due to space restrictions, but look at all those grandparents! Damn, I hope my Mom never finds out. I’ll send her a pic and hopefully that will suffice. The music teacher actually starting playing “Pomp and Circumstance” on the keyboard and in marched the kindergarten class. No one told me they would be wearing cute little mortar boards! I kind of lost it a little when I saw those damn mortar boards, actually. Audrey was in the middle of the group and when we walked in I could tell she was rubbernecking, try to spot where we were sitting. Me, in 100% goofy Dad mode, half rose out of my seat and gave her a hearty wave. She caught it and tapped the top of her head in response. This is this thing my wife started with her. You know how some new agey people say you can teach your infant sign language so that they can tell you if they are hungry or if they have pooped their pants? (SPOILER: they are ALWAYS hungry and they are ALWAYS pooping their pants). But we didn’t know that then. We thought we were doing something helpful by teaching our baby some signs. Well, we didn’t really get all that far with it. I think the signs for “I love you” are tapping your head (the “I”), hugging yourself (the “love”) and pointing at a person or thing (the “you”). Audrey never really learned anything past the head tapping part, and that became short-hand for “I love you” when she was a baby, and from time to time she still does it when she’s trying to be cute or something. Audrey was feeling anxious about this whole graduation thing, so my wife told Audrey about this thing that Carol Burnett used to do on her show. Apparently she used to tug her ear or something and that was a signal to her Mom back home watching the show on TV. I don’t know. Something like that. So my wife told Audrey she could do that at the ceremony and it would be our little signal. And so she did. I feel like I’m over-explaining all this. So what else is there to say? They sang a couple of songs, and then each one had their name called and they walked across the floor to get their “certificate of completion”. We were encouraged to clap for everyone, but really who cares? I was really only interested to see Audrey, and sure enough, even at kindergarten some kids got more applause than others. It’s hard to be some screenwriter when you happen to die the same year as Robin Williams, and the same mentality held sway here. Some kid called “Malcolm” got the most applause. I don’t know. He didn’t look that great to me. Audrey’s turn went by way quicker than I thought, and she skipped so fast to the other side of the room she lost her mortar board and the principal had to stick it back on. After that, I was restless while the rest of the kids got called, but it was all over soon enough, with cake and iced tea for everyone who came (even for those interloping grandparents). Two blog posts in two days, you say to yourselves? It’s true. It’s your old blog buddy, trevorlibrarian, here. Not some blogbot or God forbid, an intern who has logged into the lighthouse’s dial-up connection. Yes, that’s right: we’re sill working on mid 90’s technology here. They haven’t figured out how to run cable out to the island where this lighthouse stands yet. (I’VE SAID TOO MUCH). First: a knitting update for all of our new crafty followers who joined us after our misleadingly tagged blog post yesterday. It’s true that I mentioned knitting yesterday, but I mostly wanted to talk about Dave again. Dave is this summer’s Mr. Pauls apparently. (That’s a deep cut for regular readers). So: knitting update. I found some string today on the kitchen table. It might have been yarn, but it was PRETTY THIN and not very FURRY. I asked my daughter if she knew what it was and she couldn’t give me a straight answer. So that’s been the knitting update. I can tag this post “knitting” again with a clear conscience. So, the REAL reason I wanted to check in is that LAST NIGHT WAS THE FIRST NIGHT OUR DAUGHTER ACTUALLY RODE HER BICYCLE BY HERSELF. So yeah: I had this vision of me (and my wife) being out there with our daughter, patiently encouraging her as she went back and forth down the sidewalk, falling, struggling, getting back up, scraping knees, hug breaks for encouragement, more falls, more little victories, and this would go on for a couple of weeks and then she’d be off and it would be like a commercial for the Mormons and all would be well. I’d strip down to my Mormon-sanctioned undies and pour myself a nice cold glass of WHITE MILK and……do whatever Mormons do with their MANY WIVES after supper. Most Mormons don’t have multi-wives any more, right? The official church stepped away from that a while back, I’m pretty sure. I watched the first couple of seasons of HBO’s “Big Love”. I know what’s what. I don’t know what that Bill Paxton guy was thinking. Jeanne Triplehorn is all you really need in a wife, isn’t she? I mean, she’s the real deal. Look at her! Why did he have to go marry Chloe Sevigny? And then Ginnifer Goodwin? That lady doesn’t even have a properly spelled first name. It was all just too much. Three houses? Come on now. Well, anyway, the reality was nothing like a Mormon ad. Our Audrey went through the usual stages of stroller, wagon, tricycle and then a BIG GIRL BIKE two summers ago. We had some training wheels on there, but I think they were second-hand and one of the screws was stripped so you couldn’t go more than a couple of blocks before you had to stop and reattach the trainers. It wasn’t great. I honestly don’t remember having training wheels as a kid. They seem to slow down the process. For me, there was just a time when I couldn’t ride my bike and then all of a sudden a moment when I could. It was almost that seamless for our daughter. At the end of summer two years ago, we took the training wheels off and tried riding without them for one afternoon and the result was so traumatic for everyone involved that we spent most of last summer not riding anything. Then, at the end of last summer, my wife acquired this weird “third wheel” contraption that would attach to her bike and Audrey had her own set of handlebars and her own seat. She would ride along like as if she were in the rumble seat of a 1920’s Model T and we went for quite a few bike rides as a family in our extended autumn last year. So fast-forward to last night. Our daughter asked if she could “practice” riding her bike in the front yard after supper. I thought that was a good idea. The soft grass would break her fall on the countless expected spills. My Mormon Ad Moment was finally here! Well, you can imagine my surprise and chagrin when I came out to the front yard to see our daughter PERFECTLY RIDING HER LITTLE TRAINING-WHEEL-FREE BIKE back and forth in front of our house. I went to get my wife. “How long has she been doing this?” I asked her. So, we have a new bike rider in our house now. Another challenge met. Another victory won. Another milestone passed. So I turned 40, everybody! Last Saturday, in fact. I’ve been going back and forth on this in my head for the last little while. The emotions range from panic to melancholy to indifference. In some ways, I should be just celebrating the fact that I’ve made it this far. It’s true that it is a “big birthday”, but isn’t every birthday a big one? Just recognizing that you’ve gone through another cycle of spring summer fall and winter and are still here doing your thing I guess is something to celebrate. Why is 40 any better than turning 39, or 41? IT’S BECAUSE IT’S A ROUND NUMBER, I guess, and we like to celebrate things like this, or if not celebrate, then at least mark them in some way. I wasn’t even sure if I was going to blog about this, because my first couple of attempts didn’t seem to strike the appropriate tone. The first attempt was all full of false bravado: “Look at me and my life at this moment and all the wonderful things life has to offer….” I mean, gag, right? And the second attempt sounding disturbingly like a suicide note. “By the time you read this, I will have passed over…….into my forties, guys.” It was a bit too Lenten for how I was actually feeling. And yet, last week, our daughter leapt out of bed on her birthday and shouted, “I’m five! I’m five!” and flew around the house blissfully unaware that she was being really loud. She was so excited that she could barely eat her breakfast. I can tell you that I did not rise with the same level of unbridled joy last Saturday. There were no shouts of “I’m 40”, and I certainly don’t have any wise words for all you youngins out there. Certainly nothing quite as lovely and eloquent as Oliver Sacks did last summer when he wrote this piece about turning 80. But he has had an extra 40 years to come up with something great, so cut me some slack, people! I am happy to report that I actually did have a lovely birthday. A relaxed brunch of crepes (bananas and peanut butter in a crepe is really good! Maybe that’s my bit of wisdom upon turning 40?) started things off, then I even managed a small nap in the afternoon. I’m still not sure how I pulled that off, but I think my wife cut me some slack on account of it being my birthday and everything. Then for supper we went out a favourite restaurant, followed up by going to a play starring my brother-in-law and his girlfriend. (I say girlfriend, but they’ve been together for like 15 years. They aren’t married so I can’t really say wife but I can’t quite bring myself to say partner. So I don’t know. Girlfriend doesn’t seem strong enough, “common-law wife” sounds seedy, so I don’t know.) My apologies for this diversion. I DO tend on ramble on here, don’t I? I address the issue of “the filter” a little later, and maybe turning 40 is as good a time as any to turn that damn filter on. We’ll see how that goes. I do think that turning 40 is a psychological milestone as much as it is a physical one, if not more. I still kind of look like a dude in his 30’s I think. (or maybe I’ve been a guy in his 30’s that kind of looks like he’s in his 40’s, I don’t know). I certainly don’t feel any different physically, but I didn’t really expect to. I mean I’ve sort of always felt the same way all along: some days with more energy and optimism, other days with a bit of dark despair behind my eyes and I expect this to continue for the duration. But what’s going on inside my head? That’s the question, isn’t it? The question that we’ve all be wondering about for four decades. The secret loves, ambitions, fears, doubts, joys that we all carry. What about them? Do they get tempered in our 40’s? Do we negotiate a certain happiness at the expense of our dreams? Is the sound of a man blowing out 40 candles on his cake actually the true sound of settling? How does someone in his 40’s act, or is supposed to act? Can I still make goofy jokes? When does it become unseemly? Do I need to filter what I say and think a bit more? Probably, right? I mean, I should be doing that anyway. Do I need to start to wear sweater vests? How about considering a comb-over as an option? I’ll still wear Birkenstocks, but maybe should I start to wear brown dress socks with them? I’m already taking Metamucil on a daily basis, so the jokes on YOU, 40, when it comes to my dietary fibre intake. And what about my musical tastes? I’m getting more and more worried that I’m just going to stop caring about new bands and artists. I’m going to just freeze at whatever I like now and slowly slip into irrelevancy. I think I told this story about visiting my aunt and uncle’s a few years ago, but it bears repeating. My wife and I dropped in on my aunt and uncle, who were in their 80s at the time. It happened to be right around supper, and they kindly invited us to stay for burgers, which we did. As we ate, I heard a noise coming from the family room. 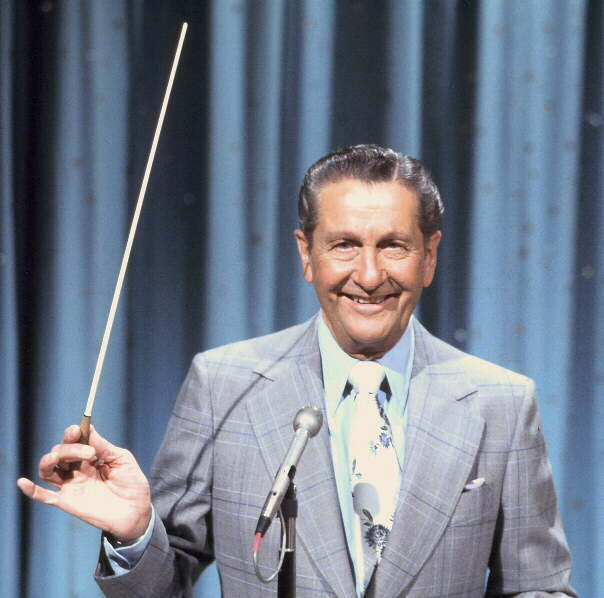 The TV was left on, and as I went through to use the bathroom, I noticed that it was on PBS and it was a rerun of “The Lawrence Welk Show”. We must have been over there Sunday night. A horrible thought crossed my mind that my Uncle and Aunt maybe didn’t realize that this was a rerun and that they were watching it not out of any irony, but because they genuinely liked that kind of music and show and that maybe, just maybe, they thought it was happening all live. I had a sudden flash-forward of me sticking on my “U2 ZOO TV Live from Sydney 1993” DVD forty years from now and some dumb nephew of mine shows up right at supper time and forms the same opinion of me as I did of my uncle and aunt. But maybe I worry too much. People like what they like, and if cheezy 1970’s variety shows is your thing, then where’s the harm? In fact, I think I’d be far more disturbed if my uncle and aunt started talking knowledgeably about the Wu Tang Clan or Public Enemy. I’ve probably already slipped into irrelevancy without even knowing it. I learn about new TV shows and movies from friends and online sources, but I can’t keep up with everything. Working in a public library DOES help, though. I’m constantly getting asked for the newest books, authors, movies, music and I can’t help but know of them, if not actually read, watch, or listen to them. I guess life should be a continual journey of discovery and experience. If I’m lucky enough to make it to an advanced age, I hope I am able to love the things I love, but be open to new and creative things as well. Keeping the balance at any age. Now if you’ll excuse me, I’m off to have a nap, and STAY OFF MY LAWN.